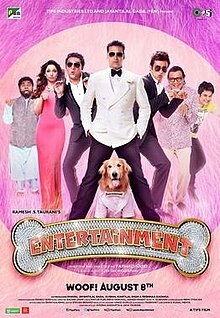 Entertainment is a 2014 Bollywood comedy masala film directed by the duo Sajid-Farhad in their directorial debut. Starring Junior, Akshay Kumar Tamannaah Bhatia in the lead roles, the film is produced by Ramesh S. Taurani of Tips Industries Limited. Entertainment was released on 8 August 2014. The film starts with Akhil Lokande (Akshay Kumar) getting paid for doing an ad, where he gets into a fight, as he wasn't paid the full amount of money that they had promised. This continues with a few other ads, where Akhil constantly ends the fight when he gets a phone call, and says he has to go somewhere. He then arrives on a shoot where Sakshi (Tamannaah Bhatia) is shooting for her television series. After her shoot lets out, they go for a walk around the park, observing other couples. At the end of their walk, Akhil proposes Saakshi. Akhil and Saakshi go to her father's (Mithun Chakraborty) house, where they are told that until Akhil becomes rich, he can't marry Saakshi. Akhil goes to his film-obsessed friend, Jugnu's (Krushna Abhishek) shop. He tells him that he is going to visit his father at the hospital because he has chest pain. However, his father (Darshan Jariwala), is actually acting and is dancing around with the nurse, only staying in the hospital because it has service like a 5-Star hotel. Akhil arrives just in time to hear and see this, and goes to beat up his father, when he reveals that Akhil is adopted and his real father wasn't ready for a child so his mother left, but was killed in a train crash. Luckily Akhil survived, and when the railway officers were giving one lakh rupees for the families who's even one member dies, he adopted Akhil to claim the compensation. Then Akhil beats him up. He goes back to his house, and opens the chest that he never had before, which contains love letters from his real father, to his mother, and a locket with his father and mother's pictures. He discovers that his father is Pannalal Johri (Dalip Tahil) who is a billionaire in Bangkok. Right as he finds this, on the television comes news that Pannalal Johri is dead and his 3000 crore's will go to anyone who can prove that they are related to Pannalal Johri. He also meets Johri's lawyer Habibullah (Johnny Lever). After arriving at Johri mansion, his father's house at Bangkok, Akhil discovers that a dog named 'Entertainment' is the owner of Johri's property, and is actually Johri's pet dog. They try to kill Entertainment, by having Akhil become Entertainment's caretaker, but fail. Saakshi and her father surprise Akhil at the mansion, and discover that Entertainment is the heir, causing the father to declare that Saakshi will never marry Akhil. At this time 2 brothers, Karan (Prakash Raj) and Arjun (Sonu Sood), the 2nd cousins of Johri, escape jail. Karan and Arjun want to kill Akhil, because they figure that the dog will die in a couple of years anyway, and thus while Akhil is attempting to kill Entertainment, by drowning him under a thinly iced lake. Karan and Arjun hit the ground at the same time as Akhil causing him to nearly fall in, but Entertainment saves the former, and falls into the lake instead. After a lot of efforts Akhil fails to save Entertainment but suddenly he comes out of the water and they develop feelings for each other. Akhil realizes his mistake and learns that Entertainment is a good hearted and good dog so he becomes his friend and leaves the mansion. Karan and Arjun, citing that their lawyer knows the judge very well, inappropriately acquire the property from Entertainment. Akhil learns this news and returns. He vows that he'll get the property back for Entertainment. Akhil's strategy is to divide the two brothers and conquer. He manages to get a job as a servant at the mansion, now owned by Karan and Arjun. Akhil attempts to split the two brothers, first by introducing Saakshi who seduces the two brothers separately. However, the scheme fails as background music rejoices the two brothers. Akhil again attempts trying to split two brothers, this time by introducing a false impression of a ghost of Entertainment the dog. The two brothers quarrel and accuse each other of illegally disguising as Entertainment and they tricked the judges. Akhil's friends tape this conversation slyly, however, the CD drops accidentally and Karan and Arjun realize that all this was planned by Akhil. Entertainment runs with the CD. Karan, Arjun and their gang chase the dog, Akhil, and his friends. Akhil manages to beat them all. Later, Karan shoots Akhil, but Entertainment takes the bullet by jumping in front of Akhil. Akhil gets angry and beats up Karan black and blue. Entertainment is taken to the hospital but unable to get saved, Akhil in a fit of anger he punches him but at this process he had saved him. Karan and Arjun come to apologize to Entertainment, who failing to understand their greed at first place, forgives them. Saakshi's father gets Akhil and Saakshi married while Entertainment also marries a female dog in the same ceremony. This film ends when it shows that Akhil and Saakshi live a life with Entertainment and his wife (the female dog) and finally at the end it shows the social message Love your pets and they will entertain you all your life. While working on Phata Poster Nikhla Hero in June 2013 producer Ramesh Taurani confirmed that the film's cast will include Kumar, Bhatia, Chakraborty, Sood, Prakash Raj, Lever and Abhishek. In February 2013, Taurani confirmed that the film will feature Kumar in the lead role. Bhatia's involvement with the project was confirmed the following month. In April, Taurani confirmed that Sonu Sood and Prakash Raj will be playing the antagonists and that Johnny Lever was also part of the project. Sood had earlier acted alongside Kumar in the comedy drama Singh Is Kinng. The film was tentatively titled Entertainment. In an interview, Sajid-Farhad said that Kumar had motivated them to start their directing career. They said that they had prepared the script for their directorial venture a long time ago. Shooting started on 3 June 2013 in Mumbai where the mahurat shot was filmed. Television actor Hiten Tejwani also did a special appearance as a TV presenter. An audition was conducted in Bangkok for the role of the dog–Entertainment. A Golden Retriever named Wonder Dog was chosen from a total of 50 dogs to play the role. In June 2013, the producers, directors and Kumar discussed about shooting locations. Kumar expresses his wish to shoot the film in Bangkok, where he had worked as a waiter and trained in martial arts. The finalised locations included Baanpradhana Bungalow in Ongkuruk, Asiatique Mall, Ancient City, Bangkok University and Ongkuruk Railway Station. The film was scheduled to premiere on 28 March 2014. On 1 July, shooting started in Bangkok for a three months long schedule where 80% of the film was shot, remaining 10% of the film was shot in Mumbai with one song in Goa during late 2013. Shooting was wrapped up in April 2014. A few songs and an item number were shot in Mumbai. The Censor Board of Film Certification in India had objected to Abdullah, the name of Johnny Lever's character in the film. The board's objection was based on the fact that the name of the character is sacred and it was mispronounced by several other characters throughout the film and this would have hurt the religious sentiments of people. The board had asked Sajid Farhad to change the character's name. They complied with the board's instructions and changed the name to Habibullah. The changes were made just a week before the release of the film. The board had also objected to use of the word HIV during a joke in the film and subsequently it was muted. Another of board's objection was the use of trident by Kumar's character in the film. The shot was removed. All the costumes used in the filming were donated to the youth organization in Defense of Animals. It auctioned the clothes and the money collected in this way was used for the benefit of stray animals. Kumar also bought one clothing item. The lead actress Tammanah Bhatia stated that she would donate all the costumes used by her in her future film projects to such initiatives. Earlier titled It's Entertainment, the teaser trailer of the movie unveiled on 14 May whilst the theatrical trailer was released on 19 May. Politician and animal rights activist Maneka Gandhi was the chief guest at the trailer launch ceremony. The producers initially wanted the film to be titled Entertainment but Amole Gupte had already registered for his upcoming film but in July 2014 Gupte donated it to the Sajid-Farhad as a friendly gesture. Kumar decided that the credit for the dog Junior should appear before his. Some fraudsters released a poster of the film and invited people to attend the music launch at Birla Matoshree. Producer Taurani warned people about the fraud posters. The film's satellite right were sold to Zee TV; though the producers did not disclose the amount, media speculated that the deal was worth ₹100 crore (US$14 million). The soundtrack is composed by Sachin–Jigar. It will be the first time that Sachin - Jigar have worked with Akshay Kumar. The song "Teri Mahima Aprampar" was taken from the Telugu film D for Dopidi. Kumar also sang one of the tracks of the film. The YouTube link of the making of the song was uploaded on Twitter. "Johnny Johnny" was released first. Based on a nursery rhyme, the song featured Kumar lip-synching to a female voice. The directors said about the song "In a small subtle way, we are showing our support for women empowerment". Sunitra Pacheco of The Indian Express said that it had "all the ingredients to become a new party anthem". In a review for Rediff.com Joginder Tuteja said that the film's music "is entertaining, providing good fun at a frantic pace." He called "Veerey Di Wedding" "an infectious number" and praised Mika's voice. About the song "Johnny Johnny", he said "It has addictive beats that get you hooked at the first listening" and praised the lyrics and singers. He added that the song "will be played for many months, till the next New Year party at least." Meena Iyer of The Times of India praised the film's humour, Kumar's acting and his bonding with the dog, especially in comic scenes. She stated that though the dog was not a good actor yet "his eyes can melt your heart." She said that the directors could have kept the film "tight". Mihir Fadnavis of Firstpost called it a "sheer genius" and said that it was Kumar's funniest film since Hera Pheri. He wrote that the film satirised all of the Sajid-Farhad films and took "potshots at everything that is wrong with desi cinema and television." He also appreciated the scene transitions and called it "technically great." Hindustan Times's Sweta Kaushal criticised the screenplay, Kumar and Prakash Raj's acting. She said that Bhatia "[did not] have much to do" and Chakraborty did not have much screenspace. However, she praised Abhishek's comedy and said that it was the "[only] bright spark in the film." She concluded her review by saying that the film was neither a "great piece of art" nor entertaining. Prior to the film's release, Hindustan Times published an article titled Four reasons why you shouldn't waste your time on Entertainment and criticed the film's story, songs and dialogues. Shubha Shetty-Saha of Mid Day wrote "Entertainment pleasantly surprises with its delightful absurdity and sure gets you roaring with laughter at several points." She called it a child friendly film and appreciated the dialogues and the performance given by the actors. However, Saha stated that the pace of the film's second half was slowed down by the excessive melodrama. Writing for The Indian Express, Shubhra Gupta called the film "dull and loud". She criticised the film's story and dialogues. Rohit Khilnani of India Today appreciated Kumar, Bhatia and Lever's performance and wrote that the rest of the cast was wasted. He criticised the plot and called it "senseless and full of loopholes." "[Entertainment] is the film which misses the point entirely : it is dull and loud, with a brow so lowered that it reaches the floor." – Shubhra Gupta in her review for The Indian Express. Sukanya Verma of Rediff.com wrote "Entertainment is unapologetically filmi in its trappings, treatment, thought." She further wrote that the film was "mostly a garrulous, occasionally comical farce that intermittently serves as reminder that in the search of "entertainment, entertainment, entertainment" one can always rely on the delightfully loony Johnny Lever." Gayatri Sankar of Zee News called Kumar's acting one of the best comic performances he had given so far. She also appreciated the film's screenplay, cinematography, dialogues and the actor's portrayal of their respective characters. She wrote that a few of the songs could have been removed and the directors had succeeded in giving the message of treating "animals with respect and love". Writing for CNN-IBN, Rajeev Masand termed the film's humour repetitive and lazy. He criticised the film's story but appreciated Lever's performance by calling him "the single saving grace in this overcooked, misguided comedy". In his review for Bollywood Hungama, critic Taran Adarsh praised the humorous writing and the comedic acting talents of the actors. He called the film "a joy ride that lives up to its title." However, Daily News and Analysis called it a commercial failure and Tamannah Bhatia's third disaster in a row. The film released on 8 August and collected ₹11.16 crore (US$1.6 million) on the same day. However, the performance at multiplexes in metropolitan areas was low. On the third day of release it collected about ₹14 crore (US$1.9 million). During its first weekend it managed to gross ₹36.69 crore (US$5.1 million) and Indian film website Bollywood Hungama declared it Akshay Kumar's 7th highest opening weekend grosser. Entertainment recorded the ninth highest opening weekend collection of 2014. In its first 5 days of screening it collected around ₹42 crore (US$5.8 million). In its first week the film grossed ₹56.50 crore (US$7.9 million) at the Indian Box office. It grossed ₹3.52 crore (US$490,000) on its second Friday, which was a national holiday. The film received tough competition from Ajay Devgan starrer Singham Returns which released on the same day. Entertainment was declared a hit film and trade analysts expected that it would be able to gross ₹70 crore (US$9.7 million) during its total run. In its second weekend it added approx. ₹8.25 crore (US$1.1 million) more to its total collection. Till second week the film's total collection had reached approx. ₹62 crore (US$8.6 million). However, it performed poorly during the third weekend and collected around ₹1.30 crore (US$180,000). The film's producer Ramesh Taurani expected the film to do better business but was happy with the overall performance. Box Office India declared the film as a "Hit". ^ a b c "Entertainment - Movie - Box Office India". Retrieved 19 November 2016. ^ "Entertainment (2014) - Box Office Earnings". Bollywood Hungama. Retrieved 10 April 2016. ^ "Entertainment's 3rd Weekend Box Office Collections". koimoi.com. 4 April 2016. Retrieved 10 April 2016. ^ a b Riteish Deshmukh, Shreyas Talpade make cameos in Entertainment. 1 August 2014. ^ "Hiten Tejwani to star in 'It's Entertainment' with Akshay Kumar". Ibnlive.in.com. Retrieved 11 August 2014. ^ Kulkarni, Onkar (22 June 2013). "Akshay Kumar's It's Entertainment travels from India to Bangkok". The Indian Express. Mumbai: Indian Express Limited. Retrieved 31 December 2014. ^ a b Sharma, Garima (10 June 2013). "Akshay Kumar to work with a dog in Ramesh Taurani's next". The Times of India. The Times Group. Retrieved 31 December 2014. ^ Bollywood Hungama News Network (8 February 2013). "Akshay's next to be directed by Sajid-Farhad". Bollywood Hungama. Retrieved 31 December 2014. ^ Press Trust of India (6 March 2013). "Tamannaah to do a 'masala' entertainer with Akshay Kumar". CNN-IBN. Retrieved 31 December 2014. ^ Bollywood Hungama News Network (23 April 2013). "Akshay Kumar to battle Sonu Sood and Prakash Raj in Ramesh Taurani's next". The Indian Express. New Delhi: Indian Express Limited. Retrieved 31 December 2014. ^ Kotwani, Hiren (15 May 2013). "Punjabi mundas Akshay Kumar and Sonu Sood bond". The Times of India. The Times Group. Retrieved 31 December 2014. ^ Sahgal, Geety (5 May 2013). "Akshay Kumar's next tentatively titled 'Entertainment'". The Indian Express. Mumbai: Indian Express Limited. Retrieved 31 December 2014. ^ Indo-Asian News Service (17 June 2013). "Akshay Kumar is our godfather, says Sajid-Farhad". Mumbai: CNN-IBN. Retrieved 31 December 2014. ^ Bollywood Hungama News Network (17 April 2013). "Akshay Kumar, Tamannaah Bhatia start shooting for Sajid-Farhan's film from July 1". The Indian Express. Mumbai: Indian Express Limited. Retrieved 31 December 2014. ^ KBR, Upala (5 June 2013). "All the best: Rohit Shetty". Daily News and Analysis. Diligent Media Corporation. Retrieved 31 December 2014. ^ Press Trust of India (30 June 2013). "Hiten Tejwani to do film with Akshay Kumar". Mumbai: NDTV. Retrieved 31 December 2014. ^ "It's Entertainment / Slurpy kiss". The Indian Express. Mumbai: Indian Express Limited. 20 June 2014. Retrieved 1 January 2015. ^ Das, Anirban (19 June 2013). "Akshay Kumar returns to Bangkok". Hindustan Times. Mumbai: HT Media. Archived from the original on 31 December 2014. Retrieved 31 December 2014. ^ Bollywood Hungama News Network (1 July 2013). "Ramesh Taurani's It's Entertainment targets extended weekend release". Bollywood Hungama. Retrieved 31 December 2014. ^ Tuteja, Joginder (28 June 2013). "Akki follows in Sallu's footsteps". Mumbai Mirror. The Times Group. Retrieved 31 December 2014. ^ Indo-Asian News Service (22 October 2013). "Akshay-Tamannah's 'It's Entertainment' to have an item number". CNN-IBN. Archived from the original on 25 October 2013. Retrieved 28 December 2014. ^ Times News Network (11 April 2014). "Tamannaah wraps up shooting for Akshay Kumar's film". The Times of India. The Times Group. Retrieved 28 December 2014. ^ R Kanabar, Ankita (18 April 2013). "Akshay, Abhishek, Riteish confirmed for Housefull 3". The Indian Express. Mumbai: Indian Express Limited. Retrieved 1 January 2015. ^ Indo-Asian News Service (23 October 2013). "A promotional song in Akshay Kumar's next". Hindustan Times. New Delhi: HT Media. Archived from the original on 20 May 2014. Retrieved 1 January 2015. ^ "Censor Board objects to Johnny Lever's character name in Entertainment". India Today. Living Media. 7 August 2014. Archived from the original on 10 August 2014. Retrieved 10 August 2014. ^ "Akshay Kumar auctions Entertainment clothes for strays". India Today. Living Media. 4 August 2014. Archived from the original on 10 August 2014. Retrieved 10 August 2014. ^ "First Look: Akshay Kumar, Tamannaah Romance In It's Entertainment". Times Internet (The Times Group). 14 May 2014. Archived from the original on 15 May 2014. Retrieved 28 December 2014. ^ "Trailer out: Akshay Kumar on all fours in It's Entertainment". India Today. New Delhi: Living Media. 19 May 2014. Archived from the original on 20 May 2014. Retrieved 28 December 2014. ^ Maniar, Parag (16 May 2014). "Canine presence tempts Maneka to launch Akshay's trailer". The Times of India. The Times Group. Retrieved 28 December 2014. ^ "Akshay Kumar starrer 'It's Entertainment' undergoes title change". Mid Day. 12 July 2014. Archived from the original on 28 December 2014. Retrieved 28 December 2014. ^ "Junior- the wonder dog to have his name appear before Akshay Kumar in 'It's Entertainment'". New Delhi: CNN-IBN. 24 July 2014. Retrieved 28 December 2014. ^ Maniar, Parag (15 June 2014). "It's Entertainment: Makers warn about fraudsters". The Times of India. The Times Group. Retrieved 28 December 2014. ^ KBR, Upala (15 January 2014). "Akshay Kumar follows Salman Khan as his next film 'It's Entertainment' fetches Rs100 crore". Daily News and Analysis. Diligent Media Corporation. Retrieved 31 December 2014. ^ Indo-Asian News Service (26 July 2014). "After Salman Khan, Akshay Kumar sings for his film". The Times of India. The Times Group. Retrieved 28 December 2014. ^ Indo-Asian News Service (7 July 2014). "Akshay Kumar lip-syncs to woman's voice for It's Entertainment". India Today. Living Media. Retrieved 1 January 2015. ^ Pacheco, Sunitra (11 June 2014). "Watch: Akshay Kumar hit the dance floor in 'Johnny Johnny' song from 'It's Entertainment'". The Indian Express. Indian Express Limited. Retrieved 1 January 2015. ^ a b Tuteja, Joginder (3 August 2014). "Review: It's Entertainment's music is well, entertaining!". Mumbai: Rediff.com. Retrieved 1 January 2015. ^ Iyer, Meena (8 August 2014). "Entertainment". The Times of India. The Times Group. Retrieved 8 August 2014. ^ Fadnavis, Mihir (10 August 2014). "Entertainment review: It is Akshay Kumar's funniest film since Hera Pheri". Firstpost. Network 18. Retrieved 28 December 2014. ^ Kaushal, Sweta (8 August 2014). "Movie review: Akshay Kumar's Entertainment is a film you can totally miss". Hindustan Times. New Delhi: HT Media. Archived from the original on 28 December 2014. Retrieved 28 December 2014. ^ Kaushal, Sweta (7 August 2014). "Four reasons why you shouldn't waste your time on Entertainment". Hindustan Times. New Delhi: HT Media. Archived from the original on 28 December 2014. Retrieved 28 December 2014. ^ Shetty-Saha, Shubha (8 August 2014). "Movie Review: 'Entertainment'". Mid Day. Retrieved 28 December 2014. ^ a b Gupta, Shubhra (8 August 2014). "'Entertainment' movie review: Akshay Kumar's film is dull and loud". The Indian Express. New Delhi: Indian Express Limited. Retrieved 28 December 2014. ^ Khilnani, Rohit (8 August 2014). "Movie review: It's called Entertainment but only if that was enough!". India Today. Living Media. Retrieved 28 December 2014. ^ Verma, Sukanya (8 August 2014). "Review: Entertainment is a comical farce". Mumbai: Rediff.com. Retrieved 28 December 2014. ^ Sankar, Gayatri (8 August 2014). "'Entertainment' review: Simple lighthearted comedy, total paisa vasool". Zee News. Retrieved 8 August 2014. ^ Masand, Rajeev (9 August 2014). "'Entertainment' review: The humour isn't just slapstick , it's also repetitive and lazy". CNN-IBN. Retrieved 28 December 2014. ^ Adarsh, Taran (7 August 2014). "Entertainment (2014) : Hindi movie critic review by Taran Adarsh". Bollywood Hungama. Retrieved 7 August 2014. ^ Rakshit, Nayandeep (16 August 2014). "Akshay Kumar's 'Entertainment' fails to weave magic at the box office". Daily News and Analysis. Mumbai: Diligent Media Corporation. Retrieved 27 December 2014. "Entertainment". Box Office India. Archived from the original on 27 December 2014. Retrieved 27 December 2014. ^ a b Mehta, Ankita (11 August 2014). "'Entertainment' Box Office Collection: Akshay Starrer Performs Well but Fails to Beat 'Tees Maar Khan' 3 Day Total". International Business Times. IBT Media. Retrieved 27 December 2014. ^ Box Office India Trade Network (8 August 2014). "Entertainment First Day Business Early Estimate". Box Office India. Archived from the original on 27 December 2014. Retrieved 27 December 2014. ^ Bollywood Hungama News Network (11 August 2014). "Box Office: Entertainment becomes Akshay's 7th Highest Opening Weekend grosser". Bollywood Hungama. Retrieved 27 December 2014. ^ Box Office India Trade Network (11 August 2014). "Top Ten Opening Weekends 2014 - Kick Tops Entertainment Ninth". Box Office India. Retrieved 27 December 2014. ^ Box Office India Trade Network (13 August 2014). "Entertainment Tuesday Business". Box Office India. Archived from the original on 27 December 2014. Retrieved 27 December 2014. ^ "'Entertainment' box office collections hit Rs 60 cr, Akshay Kumar continues to cruise". The Financial Express. Mumbai: Indian Express Limited. 16 August 2014. Retrieved 27 December 2014. ^ Mehta, Ankita (16 August 2014). "'Entertainment' Box Office Collection: Akshay Starrer Benefits from Independence Day Holiday". International Business Times. IBT Media. Retrieved 27 December 2014. ^ Box Office India Trade Network (18 August 2014). "Entertainment Grosses 58 Crore In Ten Days". Box Office India. Archived from the original on 27 December 2014. Retrieved 27 December 2014. ^ Box Office India Trade Network (22 August 2014). "Entertainment Has Decent Second Week". Box Office India. Retrieved 27 December 2014. ^ Box Office India Trade Network (25 August 2014). "Entertainmnet Third Weekend Business". Box Office India. Retrieved 27 December 2014. ^ Rege, Harshada (22 August 2014). "Akshay Kumar is the real king of box office every year". Daily News and Analysis. Mumbai: Diligent Media Corporation. Retrieved 27 December 2014.